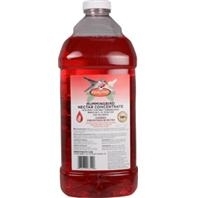 This red hummingbird nectar concentrate is designed to attract hummingbirds to your feeder. This 64 ounce bottle will make up to 256 ounces of nectar! It is made with 100% High Energy Sucrose and is easy to use. 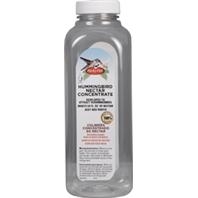 This clear hummingbird nectar concentrate is designed to attract hummingbirds to your feeder. It is made with 100% High Energy, natural sucrose. This 16 ounce bottle will make up to 64 Ounces of Nectar and is easy to use! 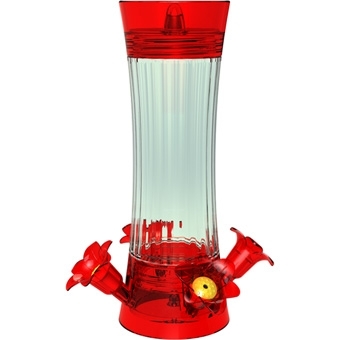 This Kit includes: A plastic feeder, nectar concentrate(that makes up to 48 ounces), feeder cleaning mop, and a vinyl coated, red hanging wire. It features 3 feeding ports. 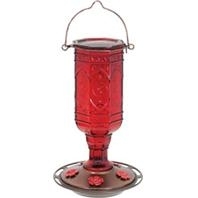 This feeder has a clear decorative glass bottle with a red top and red flowers that will attract a variety of hummingbirds. 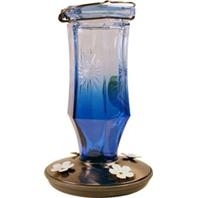 Decorative, twist-off base has four no drip flowers with perches to allow them to rest while they feed. Easy to clean and easy to fill! 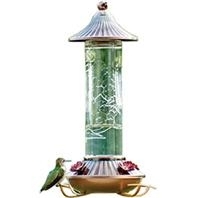 This etched glass decorative feeder features a bronze top and base that attracts a variety of hummingbirds. It has a twist-off base with four, no drip, red colored flowers. Four perches make it easy for birds to feed and relax. Easy to fill and easy to clean. 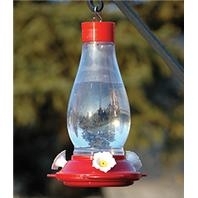 This clear decorative plastic hummingbird feeder with a red top and red base attract a variety of hummingbirds. It features a decorative, twist-off base with four, no drip white colored flowers. 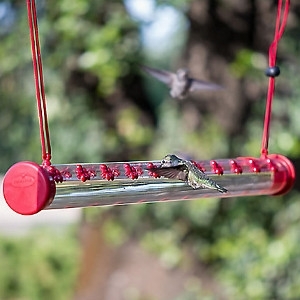 Four perches make it easy for hummingbirds to feed. Easy to clean, easy to fill. 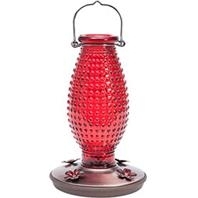 This red glass, vintage bottle is embossed with starburst accents. Features an easy fill and clean wide mouth bottle and 4 feeding ports. 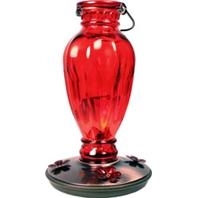 The Daisy Vase™ red glass bottle has a luster finish. 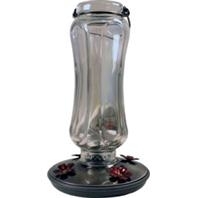 It is a traditional vase design that has a wide mouth for easy filling and cleaning. Also features 4, flower shaped feeding ports. 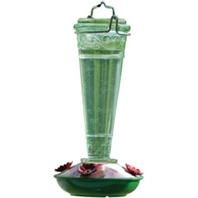 This Starglow™ Vintage Glass hummingbird feeder is clear with a starglow, luster finish. 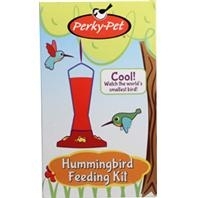 Features a wide mouth bottle for easy filling and cleaning as well as 4 flower shaped feeding ports. 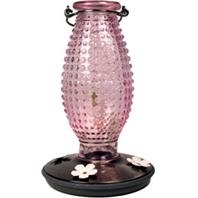 The Hobnail™ Vintage glass bottle hummingbird feeder features a beautiful pink bottle that is wide mouth for easy filling and cleaning. 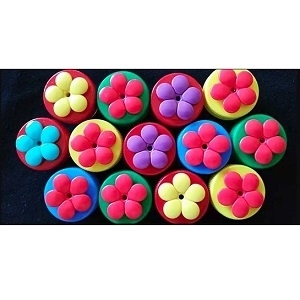 Features 4 Flower shaped feeding ports. 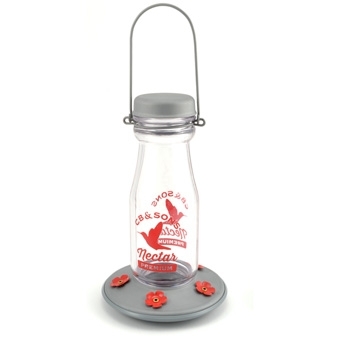 The Vintage Hobnail™ Glass Bottle Feeder features a wide mouth bottle for easy filling and cleaning. 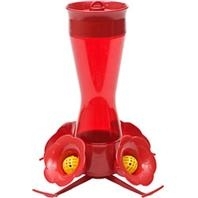 4 Flower shaped feeding ports allow birds to access food easily. This jeweled eight flute design catches the brilliance of the sunlight. Four decorative feeding ports allow several birds to feed at the same time. The hanging cap allows for branch hook hanging and a tempered glass bottle. No-Drip feeder base with built in ant moats, and bee guards. 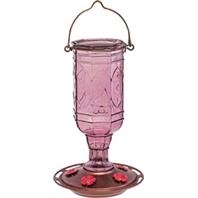 Antique Style Feeder with a stunning 8 sided (pink) glass bottle! Features 5 integrated metal flower ports for easy feeding! It's wide mouth design and beautiful glass bottle make it easy to fill, and easy to clean! The base disassembles for cleaning to reduce or eliminate spillage. 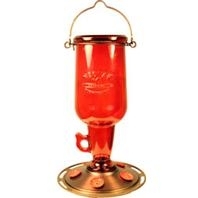 This is a lovely antique style feeder made with a stunning 8 sided, glass bottle. 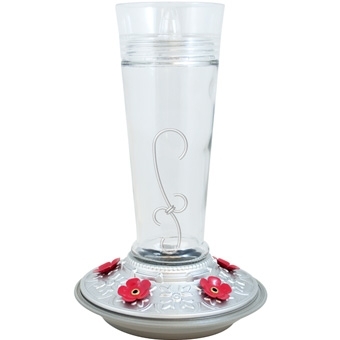 It features 5 integrated metal flower ports for feeding. The base disassembles for easy cleaning and to reduce or eliminate spillage---it's wide mouth design and beautiful glass bottle make it easy to clean! 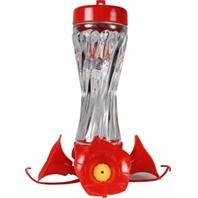 This Jug Glass Hummingbird feeder has an incredibly unique vintage bottle shape with an imprinted logo on both sides adding to the vintage look! It features 5 integrated metal flower ports. It's wide mouth design and beautiful glass bottle make it easy to fill and easy to clean. 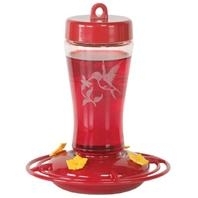 ersey Hummingbird feeder holds 18 fluid oz. Jersey has a silver finish on the cap and basin. Company logo screen-printed on the glass bottle. The wide mouth bottle makes for easy filling. The feeder comes apart for easy cleaning. 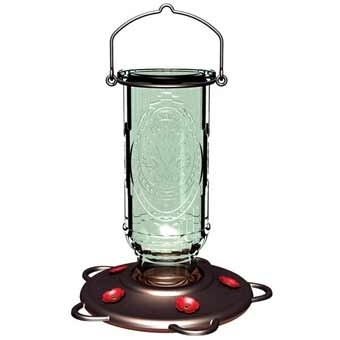 This antique vintage glass bottle hummingbird feeder features an antique glass bottle with burnt penny finsh at the base. 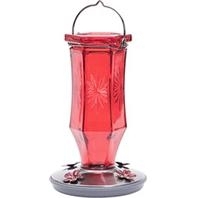 Includes 5 durable, metal perches and holds 20 ounces of nectar.